Looking for a fun and easy Halloween craft your toddler will enjoy? We created this Monster Mobile from toilet paper rolls and my 4 year old loved painting and making his monster super scary! Start by painting your toilet paper rolls any color or style you wish. The spookier the better. Blake painted his with Captain American and The Hulk in mind. Once they are all painted. Let dry a few minutes. Ours didn't take long to dry at all. 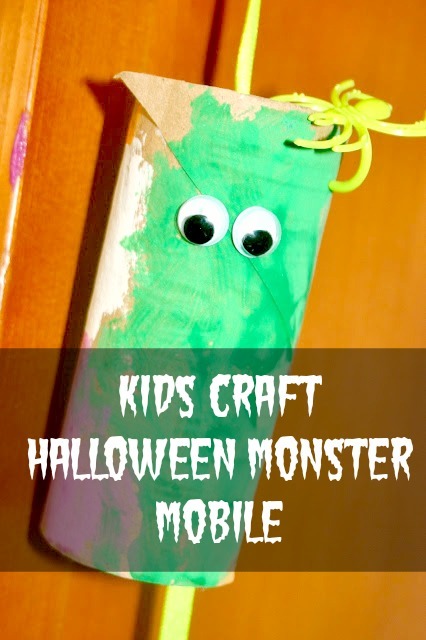 Add spooky embellishments like googly eyes, crazy arms, spooky spiders, and anything else to make your monster scary. Punch a hole into the back of your roll and tie ribbon or string through each one to attach. Now, we did not do it perfectly. The idea was to string a ribbon through EACH roll SEPARATELY at different lengths and tie the ends of the ribbon together to form a mobile. However, when you have a 4 year old who insisted they all be on the same ribbon together, so they wont be scared, it's hard to argue with that. Cut one long piece and string all three together tieing at each hole and continuing to the next, then hang.